fics and questions and general delight. I am using my 101st icon! Hurray! This was supposed to be 254-character fic for marksykins but it got too long. Tezuka feels cornered, and the part of him that isn't panicking thinks that it's because he literally is. Echizen's eyes are brimful of emotion beneath his cap, but he's not backing away, and Tezuka refuses to step all the way back against the lockers even though he desperately wants to retreat. "What have you always taught me?" Echizen says, his voice low and sharp-edged. "Don't hold back." "Yes," Tezuka says. He sounds as disconcerted as he feels. He thinks he must also look it, because Echizen steps in even closer, into Tezuka's space, and Tezuka can feel the heat between them despite his best efforts not to think about it, about the two of them like this. "Then," Echizen says, swaying on the balls of his feet like he does in a match when he is nervous or eager or both, "why are you holding back?" Tezuka opens his mouth to remind Echizen not to get careless, but Echizen interrupts. "There's a difference," he says, and the look of determination in his eyes is strong, "between a shot you can't return and a shot you won't." Tezuka stills with his hand a moment away from Echizen's hip, frozen for an eternity in which Echizen stands staring up at him with his eyes bold and fearless and beautiful on Tezuka's face. "So," Echizen says finally, his voice gone vulnerable and quiet. "Should I serve?" Tezuka hesitates. "No," he says at last, leaning forward, and the feel of his mouth against Ryoma's is better than any return. yamapea: ksdjfkj how many expressions does he really have... he seems so... stoic. Answer: he has this many. Plus many, many, many more, if you learn how to read him. nailfile: How is it that a 14 year-old guy can be like that. I can't find a 20 year-old that mature. Is it the tennis? seii_ryu: Was he ever a child? answer: Well, we don't see her much, granted. But I think that it's very likely Tezuka has a Fuji complex just from knowing Fuji. Because. How can you not? answer: Boxers. Tezuka wears boxers. Ryoma wears briefs. But... you say. For real, though. I have evidence. As you can see, Tezuka normally prefers to leave the collar of his school uniform unbuttoned and open, while Ryoma prefers the restriction of a stiff collar and very rarely unbuttons his school uniform. This tells me that Tezuka likes a healthy breeze round his privates, while Ryoma prefers the extra, erm, fortitude. Answer: Clearly it would be Atobe. 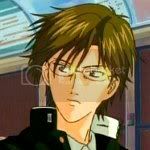 Atobe would convince him by virtue of not giving up until Tezuka had said yes, and then it would be the goal of Atobe's life to present enough of a challenge to him at tennis to keep him from being bored. answer: My favorite Tezuka moment is basically eps 63/65-68. At the moment specifically it's the part I screencapped last night where he teases Ryoma. But also just, all of The Game. Because how can that not be the thing that makes you love Tezuka forever and ever and ever and ever and ever. wonapalei: For some reason, I picture Tezuka speaking English with a faintly British accent, rather than an American one. Why is this? Mr Darcy spillover? answer: Possibly. It could also be a product of the authors you've been reading writing Tezuka as though he were Professor Snape. The chan overtones of their enormous two-year age difference are clearly taking over their collective subconscious. Fanfic writers, before you post, try hearing everything Tezuka says in the voice of Alan Rickman, and you'll know whether you've gone astray. storyteller: If he had a child, what would he name it? answer: He'd name it after his father, or his mother. Although Fuji would threaten bodily harm if he didn't name it after him. shinjokitty: TALK TO ME ABOUT DINOSAURS. Because I think I missed that episode. answer: It's in the Gay Boat Movie. I link to caps of The Dinosaur Extinction in Post #5 of my Tenipuri Guide. Go to the *cough* community and download it, if you haven't already. Wait, no! Wait til notapipe puts up the A-O version and then download. yoiyami: what kind of a job will he get when he grows up? answer: I see him being either a writer/editor (the fanbooks at one point say his ideal career would be "novelist" and I'm inclined to take that as canon) or a lawyer, because he has such a strongly developed sense of justice. I could also see him being a noted opinion columnist on public affairs, or a public advocate. notapipe: If Fuji is Tezuka's best and ultimate rival, what is Ryoma to Tezuka? answer: his best and ultimate partner. penm: What would Tezuka do if he could do anything with Ryoma? ladylamented (inspired by a fic I can't name atm) If Tezuka really does keep pictures of Ryoma in his room or even school locker, then which pictures would those be? answers: they're pictures of every winning shot Ryoma has ever made. attics: Why does he wear his glasses while playing tennis? Can his eyesight really be that bad? Or is it just because they make him look hot? It hardly seems practical. answer: I DON'T KNOW. I WONDER THIS ALL THE TIME. You'd think at least he'd need those rope thingies around the back to keep them from falling off. How does he keep them from sliding down his nose when he sweats!!!!! IS THIS PART OF THE TEZUKA ZONE? lindra: What does he think (while still in bed) when he wakes up in the morning at the time he would have to for practice on days when he doesn't have practice? answer: He coordinates practice regimens, and plans out different lineups for their next tournament, and, occasionally, lets himself think of Echizen and the way he looks when he stands on the court before a game. dancing_moo: How old do you think Tezuka will live to? answer: He will live a long and healthy life. He's too disciplined to die before he's taught his great-grandchildren how to play tennis. altricial -- How does the Tezuka Zone work and how might one achieve it? answer: through prayer and fasting, Jimson. svz_insanity: Aja. I love Tezuka. I really really do-- but lavender shirts? Please explain. answer: clearly, he is so devastatingly handsome that his mother insists he wears the most unflattering combination of clothes imaginable in an effort to stave off the millions of helpless rampant frothing fangirls (and boys) who would be accosting him at all hours of the day if he wore more attractive clothing. aziraphale_mel: WHAT DO YOU THINK HE THINKS ABOUT ON THE BUS. HOW HE CAN GET ECHIZEN TO CUDDLE UP NEXT TO HIM INSTEAD OF MOMO NEXT TIME. aidenfire: How old is he? And what grade? And, not about Tezuka, but omg, what's up with all the cats? answer: CATS. THERE IS ONLY ONE CAT. KARUPIN! who rules all! And. Tezuka is fourteen. Ryoma is twelve. ...I'll just leave you letting that sink in. Here is the herald, the spirited bearer of tiding. But underneath this effervescent enthusiasm is a person fiercely dedicated to "meaning" in life and reminiscent of the INFP crusader. Only the ENFP neither crusades nor meditates, not for long anyway. The ENFP is into everything, frisky, not unlike a puppy, sniffing around to see what's new. ENFP has to be in on everything, can't bear to be left out of anything. That's why they make such splendid reporters, newscasters, and journalists. Mercury. Now who would enjoy this frisky, bubbly - yet serious - person? The Rock of Gibraltar, of course - ISTJ, the "trustee." ISTJ, who revels in "keeping the books in order," "balancing the budget," "securing and ensuring," "stabilizing and steadying," "honoring contracts," "keeping the ship on a steady course" and "shipshape," delights also in providing anchorage and safe harbor for the heraldic ENFP. Clearly, this is the Golden Pair dynamic to a T, and I wonder if to some extent it can also be seen as the Ryoma/Tezuka dynamic. Because I absolutely think Ryoma and Eiji have a lot in common, just like Tezuka and Oishi. I think Tezuka is the needle of the compass while Echizen is the other foot that is ever in orbit. I think Tezuka's firmness makes Ryoma's circle just. (And I think that poem perfectly describes the two of them.) Tezuka keeps Ryoma grounded, while allowing him to run free. I see Eiji and Oishi a lot like that, too. I had intended to talk about tutoring today, but gosh, this post is so long already that I will save it for later. But! One more thing before I go to bed. Insta-rec: Paper Clips by lindra. This fic. I. No words. NO WORDS. TezuRyo and Tezuka's hair and paperclips and kissing, and so much in-character love that I just. I. Go. READ. Why can't I write fic like this for this pairing. This is wonderful.